The permanent spatial state of exception in the urban environment is a much-discussed topic in postmodern discourse, yet a critical re-assessment of the contemporary situation is needed. The global proliferation of urban enclaves, and in consequence their ghettoization, indicates an urgent need for social sustainability.1  Saskia Sassen, ‘Urban Gating: One Instance of a Larger Development?’ in Gated Communities: Social Sustainability in Contemporary and Historical Gated Developments, ed. Samer Bagaeen and Ola Uduku (London: Earthscan, 2016), pp. xi–xii. There is a complex relationship between a gated mind (social needs and ideas) and a gated place (order and form), which can be read as a general consequence of the decline of an institutional safety net against the unpredictability of global phenomena – andis reflected in a spatial and social crisis. The gating process in cities, or urban gating – as Saskia Sassen mentions in her article2  Ibid., p. xi. – can thus be seen as a characteristic responding to a fundamental dynamic of the current age. However, understanding it as a mechanism arising from a unique phenomenon would minimize its complexity and the everyday psychological effects on citizens. This essay, referring to social, anthropological and political themes, intends to investigate why and how this phenomenon defines the way we live, with a particular focus on how policymaking, the organization of settlements and the architecture of recent decades, caused social fragmentation in the urban environment. It is safe to say that urbanism rooted in the traditions of the twentieth century operates around three fundamental principles. The first is the ideology of capitalism, in which strategic individualization increases consumerism, diminishing the opportunity to build associations and groups or to develop revolts. The second is the everyday urban politics of fear, continuing throughout human history with fear of enemies, illness, infections or starvation. It had marked consequences for urban configurations in the past (think about the defensive walls of historic settlements or the choice of naturally protected locations) and created different kinds of biopolitical precautionary dispositifs (like vaccination against the smallpox virus in eighteenth-century Europe).3  Michel Foucault coined the concepts of biopolitics and biopower for phenomena and mechanisms that transform biological features of the human species into the object of politics or power strategies. Biopower operates through diffused networks of dispositifs, devices working from below that presuppose a grid of material coercions. Foucault identifies vaccination against the smallpox virus as a security practice that predicted the development of similar security measures in our own time. Michel Foucault, Sicurezza, Territorio, Popolazione: Corso al Collège de France (1977–1978)(Milan, Feltrinelli, 2005), p. 53 With time such devices have been refined, combined and justified by the rhetoric of security. As Bernardo Secchi wrote in La Città dei Ricchi e la Città dei Poveri: ‘Within today’s communication society, the rhetoric has material consequences which are often more evident than the instances that they try to evoke.’4  Bernardo Secchi, La Città dei Ricchi e la Città dei Poveri(Bari, Laterza, 2013), p. 23.Author’s translation. It is possible to match this rhetoric with its institutionalization in the war on crime as a tangible example in contemporary urban life. The third principle is a deep crisis of social otherness, where the other becomes the scapegoat of uncertainty in the modern life.5  For the anthropologist Marc Augè the figure of the stranger is connected to the crisis of identity, which is at the same time a spatial and a social crisis. Marc Augè, Tra i Confini: Città, Luoghi, Integrazioni(Milan, Mondadori, 2007), p. 63. Zygmunt Bauman, quoting from Claude Lévi-Strauss’s Tristes Tropiques, connects this crisis of otherness to two universal human strategies to exclude strangers in space: anthropophagy and anthropoemia.6  In the term anthropoemia ‘anthropo’ refers to humans while ‘emia’ refers to vomiting (from the Greek ‘emein’ -to vomit), Zygmunt Bauman, Modernità Liquida (Bari, Laterza, 2011), p. 111. Author’s translation. For the anthropologist Marc Augè the figure of the stranger is connected to the crisis of identity, which is at the same time a spatial and a social crisis. The first is based on the removal of diversity through ingestion and forced assimilation, historically taking forms such as cannibalism or crusades. Its modern forms can be conceived in spaces of mass-consumption like big shopping malls where the personal diversity of individuals is destroyed and where there is a clear process of assimilation. To some extent so-called non-places7  Non-Place or nonplace is a neologism coined by Marc Augè to refer to spaces of transience where human beings remain anonymous; spaces that do not hold enough significance to be regarded as places,including, for instance, airports, train and bus stations, hotels or highways. Marc Augè, Non-Places: Introduction to an Anthropology of Supermodernity (London, Verso, 1995), p. 78. can also be seen as belonging to this category. They are public but not civic spaces, they ‘discourage the idea to occupy them, making colonization or settlement practically impossible.’8  Augè, Tra i Confini: Città, Luoghi, Integrazioni, p. 113. By contrast, the second strategy is based on vomiting out the other, the misfit, through temporary or permanent isolation from the social body. This strategy is reflected in incarceration, deportation or physical abolition. In the modern urban fabric it evolved into urban segregation and ghettoization, in limited and unequal access to the territory, and in the design of interdictory spaces –a term used by Steven Flusty to define spaces designed to intercept, repel or filter would-be users.9  ‘The proliferation of interdictory spaces violates dearly held assumptions of the right to move about freely… by both dismantling communities into isolated territories and excluding classes of individuals from spaces of communal activity, [and] negate Article 20 and 27 of the United Nation Declaration of Human Rights.’ Steven Flusty, Building Paranoia: the Proliferation of Interdictory Space and the Erosion of Spatial Justice(Los Angeles: Los Angeles Forum for Architecture and Urban Design, 1994), p. 48. Available: architectureofwar.artun.ee (accessed 22 March 2018). It includes refined spatial typologies of segregation or unfriendly mutant typologies (block home, gated community, urban ghetto, suburb, world citadel and strongpoints of sale)10  ‘Commercial spaces targeted toward predominantly African and Latin American clientele in middle-to-lower income ‘inner city’ neighborhoods have been most frequently converted to strongpoints of sale. This has occurred in large part because insurance companies require such features as a precondition to providing merchants in these neighborhoods with coverage.’ They have imposed tight controls, ‘resembling colonial trading stations’ and became interdictory spaces, with fenced perimeters, armed security guards and remotely monitored by both private vigilance and the police. Ibid.,pp. 28–29.as well as design measures aimed at limiting access to space,11  Ibid., pp. 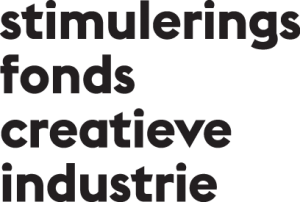 16–19. as exemplified in following case studies I personally experienced. Let’s look at an extreme example of fragmentation of the urban fabric in one of the safer cities in South America: Tigre in the Metropolitan Area of Buenos Aires. 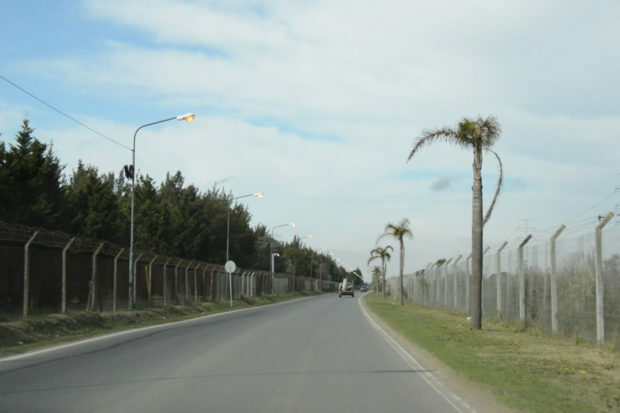 In Tigre, enclaves are very strong and constituted by an enormous development of gated communities, alongside slums. Their transfigured concept of community, based on the social and economic equality of residents, who live under high-tech anti-crime private systems of surveillance, became a synonym of isolation, where separation, protective walls and monitored gates are used to criminalize every form of diversity. They are defined as voluntary ghettos,12  Zygmunt Bauman, Voglia di Comunità(Bari, Laterza, 2001), p. 115. because they are built to prevent the presence of strangers, but residents are free to enter or exit at will, something that would be impossible in a real ghetto. These enclaves are constituted by a combination of spatial limitation and social homogeneity that fuels their own isolation, with all the associated psychological and social consequences. In Tigre, gated communities occupy half of the territory but house a mere 5 percent of residents. These numbers are crucial for understanding the contribution of policy makers to the land-use injustice, as the municipality played a substantial role in the design of this segregation, by selling an extensive territory and issuing construction permits to real estate developers while marginalizing citizens living in slums. 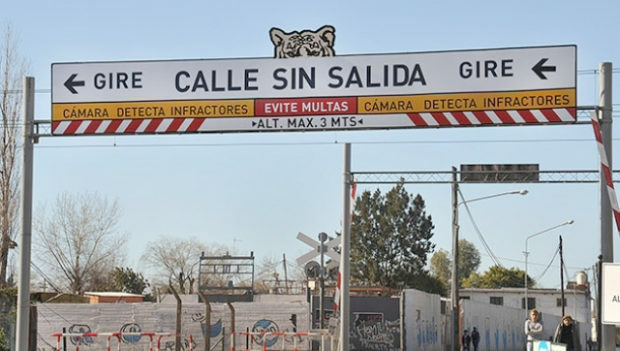 An instructive case is the placement of a fallacious street sign with the inscription calle sin salida (street without exit) by the municipality in the 2003 at the only entrance of the Almirante Brawn barrio, the biggest slum in the south of the town: a clear indication that the municipality focused on concealing urban poverty instead of resolving it. 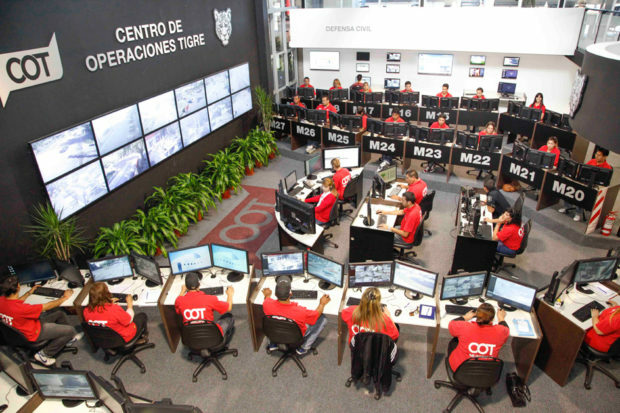 There is another factor contributing to the widespread implementation of urban gating in Tigre: the establishment of the COT (Centro de Operaciones Tigre). Based on innovative technological platforms, it is a surveillance system of one thousand cameras spread around the city and patrols operating with spectacular zeal (it is possible to watch its activity on the YouTube channel PolicialesTigre). It is connected to the rhetoric of urban fear and feeds the impression of living in an insecure city, justifying the need for special force. The COT is proudly presented as an example of success to other South American states, but the statistics reveal that systems like the COT and gated communities don’t really affect the prevalence of crime. In fact the number of criminal acts and robbery is higher inside the private protected areas than outside. Even in cases where the division between urban clusters isn’t so pronounced, strategies of segregation follow predefined schemes. In Kigali, the capital of Rwanda, which at the moment represents an island of calm in the middle of equatorial Africa, the state’s demonstration of the stability of political and economic power is causing the militarization of the city. It is manifested in the ubiquitous presence of checkpoints in the streets, and the development of self-contained high-rise office blocks, the so-called world citadels,13  Steven Flusty uses the term ‘world citadel’ to underline the similarity of contemporary high-rise office buildings with the historical walled fortress or citadel, intended to protect a ruler’s residence. World citadels are now usually administered by management companies to attract multiple corporate tenants. ‘Security provisions of world citadels are directed at maintaining the preferred user mix by preventing non-professionals and the obviously less affluent from becoming so prevalent on site as to intimidate tenant office workers and executives.’ Flusty, Building Paranoia, p. 33. Available: architectureofwar.artun.ee (accessed 22 March 2018). surrounded by parks and amenities that are restricted from public use through the presence of barriers and armed guardians. Commercial facilities that cannot seal themselves off completely for sustenance reasons have been transformed into strongpoints of sale, with double metal detector checks (upon entry and exit). The segregation of poor neighbourhoods from rich or expat residential areas is maintained by unequal access to asphalt roads, water, and electricity infrastructure. The city’s hilly geography and the fact that real slums don’t exist, but poor neighbourhoods, with small extensions, are uniformly distributed throughout the territory, has created an archipelago of ‘vacuous places’.Vacuous places are places ‘where one does not enter and where the sight of another human being makes us feel vulnerable, uncomfortable and a little frightened’;14  Bauman, Modernità Liquida, p. 116. namely places that exist only for those belonging to the same class. If we focus on this, we will realize how much our mental maps and the routes we follow in a city are influenced by what we believe are comfortable or safe zones. 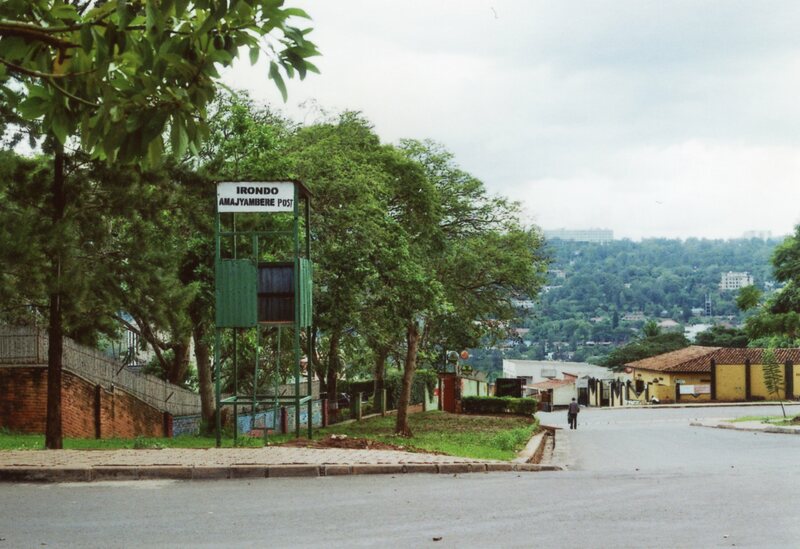 In Kigali another instance of prohibited spaces is the well-kept public green parks, where access is strictly forbidden by law. This is somehow related to the fact that in Kigali, the street has always constituted the only type of public space, and so it’s culturally accepted to not use parks or public squares as places of gathering, even if their maintenance with public money could seem contradictory. What seems less reasonable is the current unspoken limitation of access to public spaces and parks in European cities, whose functionality and social life are founded upon openness of public amenities and squares. The militarization and privatization of public space is the result of a Europe living in fear, instigated by exaggerated media coverage of Islamic terrorism and of rising criminality. Countries act as if they are in a state of emergency, but they are not. 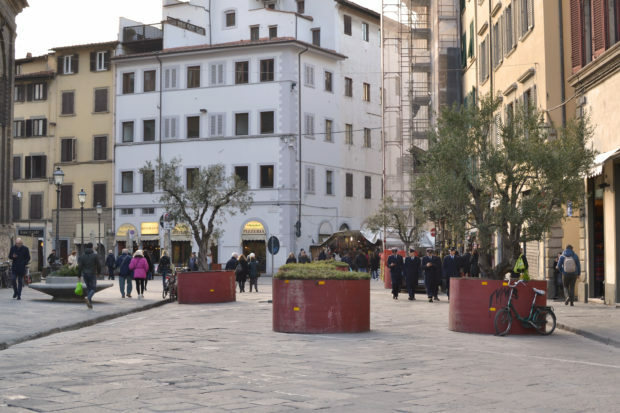 After the attack in Barcelona, in August 2017, the mayor of Florence issued a call to design beautiful, charming and sustainable (because why not) antiterrorism barriers to limit access to public spaces and squares for the sake of the security and freedom of both citizens and tourists. This was just a thinly-veiled way to accustom people to the presence of concrete New-Jersey barriers,15  Jersey barrier, or Jersey wall, also called New Jersey barrier, is a modular concrete or plastic barrier employed to separate lanes of traffic, but their use has developed as urban barriers in contests of war, as well as barriers for the limitation of access in open public spaces during exceptional events. with clear links to the imaginary of war. Their concept doesn’t change; they may make streets, parks, and shops more secure, but surely less free. 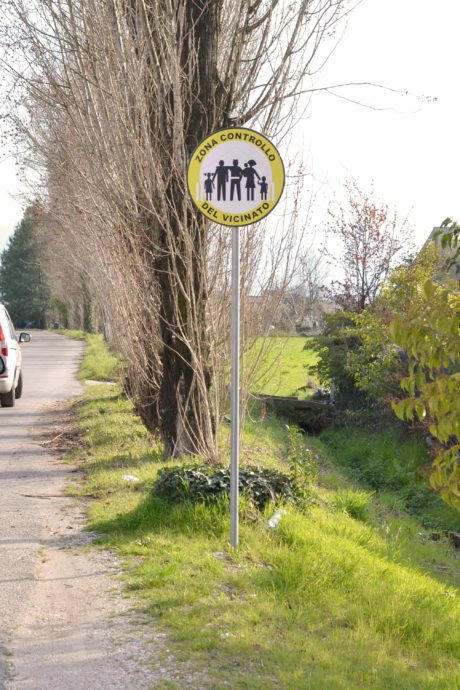 Another strategy imported from the United States and spreading through the municipalities of Italy in recent years is the foundation of neighbourhood watch patrol groups, manifesting in street signs indicating the presence of prying eyes in the area, ready to report to the authorities the presence of suspicious souls via smartphone and a dedicated app. These signs are the unworthy substitutes of real people on the street or chairs placed at the entrances of private houses, in villages and cities until a few years ago. In this living community network of relations, connected by the gossip in the shade of a tree or in the cool of the evening, in the street or in the public square, nothing escaped the collective eyes and mouths. I wonder what contribution a system of virtual alertness can provide, apart from signalling a state of constant emergency and causing a state of discomfort in public space. The disintegration of the common good in the spaces of Italian cities, created by limited access, a huge surveillance presence (human or high-tech), and extraordinary measures of control and repression during mass events, prohibit citizens from acting freely. Reduced to a passive element, the citizen experiences public space as a pseudo-public space without any civic significance and where any sort of non-institutionalized exchange (social, cultural or economical) is forbidden. The examples in Tigre, Kigali and Italy differ from each other in terms of strategies adopted as well as urban and social consequences; at the same time, what they have in common is the rhetoric of the war on crime that justifies restrictive actions and policies. These include interdictory devices, hard or soft expedients of division that generate a gross spatial injustice and unequal distribution of spatial resources in the mythical name of security. The result is the fragmentation of urban ecosystems and the reduction of public spaces to interstitial zones with no identity. In all the case studies the institutionalizationof urban fear can be read as a reaction to the fear of social changes and their unpredictability as well as the symbolic safeguarding of the status and a socio-economic power of the middle and upper classes, more than as a response to any real need to limit delinquency and illegality. Institutionalization of urban fear can be read as a reaction to the fear of social changes and their unpredictability as well as the symbolic safeguarding of the status and a socio-economic power of the middle and upper classes. These measures come from the stigmatization of the conditions of the poorest classes, in which we can include the figure of the immigrant, by wealthier classes and their institutions and administrations, regardless of whether they are in an Asian slum or the Parisian banlieue. This is why we should all look into the surveillance camera when we pass it, to remember its significance. When we observe barriers we should not just absent-mindedly navigate around them. We need to break the silent rules that design our mental maps of comfortable and secure places and we must conquer residual spaces forgotten by the system to activate them for the common good. A number of citizens’ associations and professionals working toward these objectives is gathering momentum, and they are achieving some positive results in raising awareness of the importance of public space and spatial rights. Examples are the London collective Assemble, with their pioneering project The Cineroleum (2010), temporarily transforming a disused petrol pump into a cinema, or the Folly for a Flyover (2011), where they transformed the motorway undercroft in Hackney Wick in London into an arts venue and new public space. Another example of brave and critical work is the Italian collective Stalker/Osservatorio Nomade, which operates through actively researching and walking in the most authentic and complex territories of Italy, forming relationships with the inhabitants thanks to a great sincerity and sensitivity. It is possible to read these experiences as the resistance of a new generation to contemporary, artificially fostered paranoia.